In case you haven’t stopped by recently, 2018 has been the year of construction in historic downtown Long Grove. Yes, everyone who lives, works or has visited during this time has been somewhat inconvenienced by road closures, traffic jams and those annoying red cones. Oh, then there was that huge truck that destroyed the town’s iconic gateway! The good news is, although it’s been painful at times and the renovation process is taking longer than expected, there is light at the end of the tunnel. The village is literally and figuratively, paving the way to a brighter future. 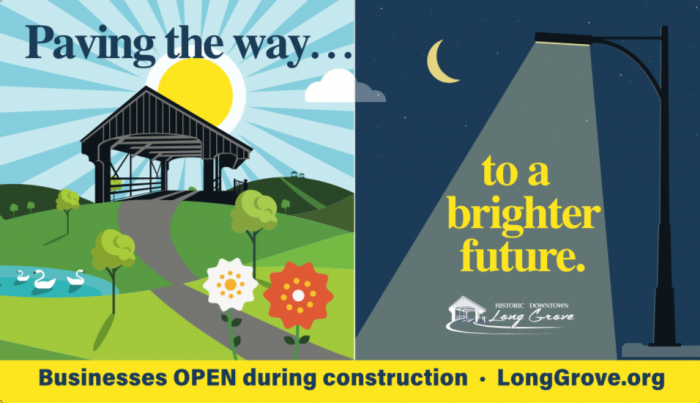 In 2019, Historic Long Grove will rise and shine once again. Through the demolition and rubble, the foreclosures and vacancies, a giant is slowly reawakening. The rebirth of this destination town is within sight. New infrastructure is attracting an exciting new crop of businesses while reinforcing the long lineage of mainstays for the next generation of visitors. These changes are vital as Long Grove looks to prosper in the new era. Besides relaunching with upgraded roads, sidewalks, and lighting, 2019 will also bring the resurrection of the Long Grove Bridge, which just before the accident was designated with the National Register of Historic Places honor. One could say that history is reinventing itself as this little hamlet shakes off the dust and embarks on a new path. Landmarks Illinois announced the 2017 Most Endangered Historic Places in Illinois on April 6, 2017, at a press conference in Springfield. Click on the name of the site in the map below to learn more about its history, why it is endangered, and how you can help. Historically called the Buffalo Creek Bridge, this rare, circa 1906 metal truss bridge that was given a wood covering in 1972 is now fondly referred to by locals as the Covered Bridge of Long Grove. According to Nathan Holth of HistoricBridges.org, despite its covering, it is one of the few pin-connected truss highway bridges remaining in Chicagoland and the only known surviving pin-connected truss bridge in Lake County. The one-lane bridge over Buffalo Creek has Credit: Long Grove Business Association Credit: Long Grove Historical Society been targeted for replacement by the Village of Long Grove to accommodate a two-lane bridge. Local residents and organizations have rallied to save the historic bridge, noting that the village’s logo and overall identity is based on its image and contribution to Long Grove’s small town charm. The Illinois Historic Preservation Agency has determined the bridge as eligible for listing in the National Register of Historic Places.Historic Downtown Long Grove Business Association is leading the campaign to save the bridge.